Join Sally Clinton for a Home Yoga Practice Adventure and get your yogiddy on! 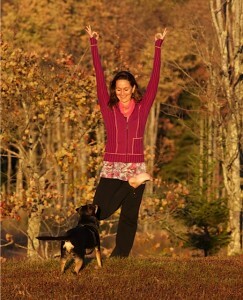 It’s true when you practice yoga regularly in a way that honors your body, you can start to feel downright giddy. In this month-long program with three additional months of access, you will be supported in developing your own home yoga practice so you can receive the many benefits that yoga has to offer, on a daily basis. So, join me and get your yogiddy on! You can participate in the Yogiddy program whenever it works in your schedule. If you’re interested in participating, please contact us. The Yogiddy program will help you and your body tone, strengthen and become more flexible, learn proper alignment, and cultivate that home yoga practice you KNOW would be great for you! You’ll receive lots of tips on how to fit a daily practice into your life, how to practice with kids, dogs, and cats climbing all over you, or other distractions around, how to make it fun and manageable, and what to actually do for a home practice. So, join me and Get Your Yogiddy On with the Home Yoga Practice Adventure! • Laughter, fun, tips, and inspiration! All to be done in the comfort of your own home. This will be a simple, manageable systematic approach to help you successfully incorporate a home yoga practice into your life. You can listen to the weekly audios at your convenience and can move on to the next week when you are ready. There are practice options for all levels, from seniors to experienced practitioners. Because I really want to support you in getting your body moving, healthy and feeling downright yogiddy, I am offering this at a super low introductory rate of not $297 but only $197 for a whole month of support PLUS 3 additional months of access to the whole Yogiddy library! That is an amazing deal! If you notice yourself saying, ‘oh it just isn’t the right time’, I want to challenge you a little on that. It is so easy to put things off that we know are good for us and convince ourselves we need to wait until the timing is right. Then years go by and we still haven’t done what we know will better serve us. This is about real life, and making the choice to take care of yourself and your body – NOW, in the midst of the wildness of every day life. There is never a better time to start. So join me and let’s get yogiddy! I look forward to supporting you in this home yoga adventure! “I am loving these tutorials! Thank you SO much, Sally. The calming sound of your voice, the clear instructions, and the fact that I can watch you are all totally effective for me! I’m getting up each morning with yoga practice on my mind and do it!” ~ S.F. “thanks for all your efforts to prepare your…life-changing yogiddy and an answer to my greatest dream… yoga videos from sally” ~ M.K. “When I wasn’t practicing regularly, I found myself feeling stiff, sore, and generally tight most of the time. That has noticeably reduced with even 15-20 minutes of gentle practice each day.” ~ M.B. “Yoga this morning felt great. Told [my wife] I feel like a new man already.” ~ G.V. “.. you’ve outdone yourself yet again” ~ S.S.
“Sally — I’ve really enjoyed your classes at home — almost as much as being there in person which, of course, is the best. I’ll be using them for a long time to come — so much still to explore, they’re so thorough. I’ve gained strength, especially in my legs, and feel generally more ready to tackle the garden, always a measure of bodily well-being. And the ripple effect is wide –one, in particular, is pretty thrilling to me: my 16-year-old niece just spent 10 days with us during her school break. We’ve always done yoga together but she doesn’t do it at home. Your videos took her to another level and she started wishing for a class at school. So she sent an email to her entire (small) school asking if anyone was interested in a yoga class — she got 12 responses and then got the headmaster to agree to it. So they’re in the process of getting a teacher and soon it will begin. I noticed a huge difference in her focus after doing yoga….Thank you for this wonderful gift!” ~ S.S.